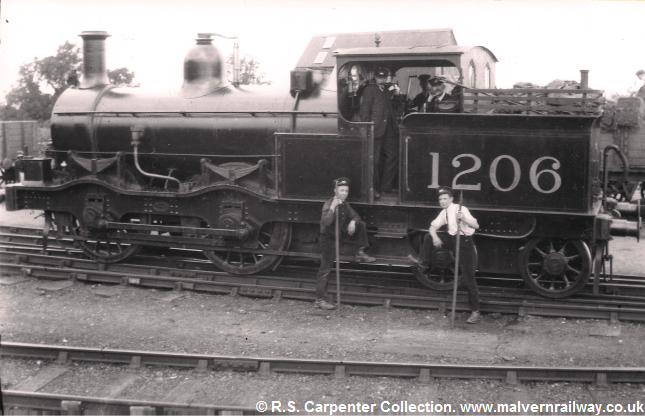 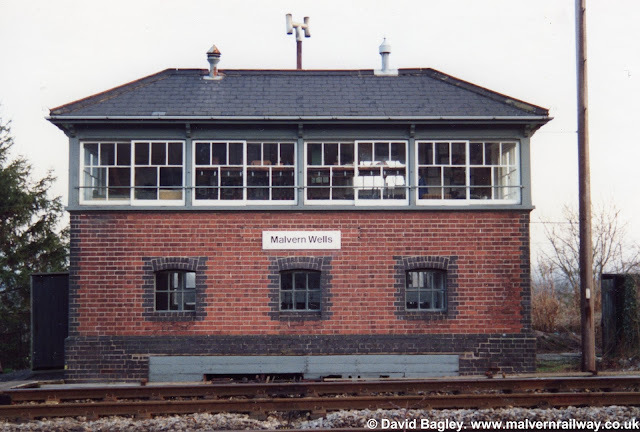 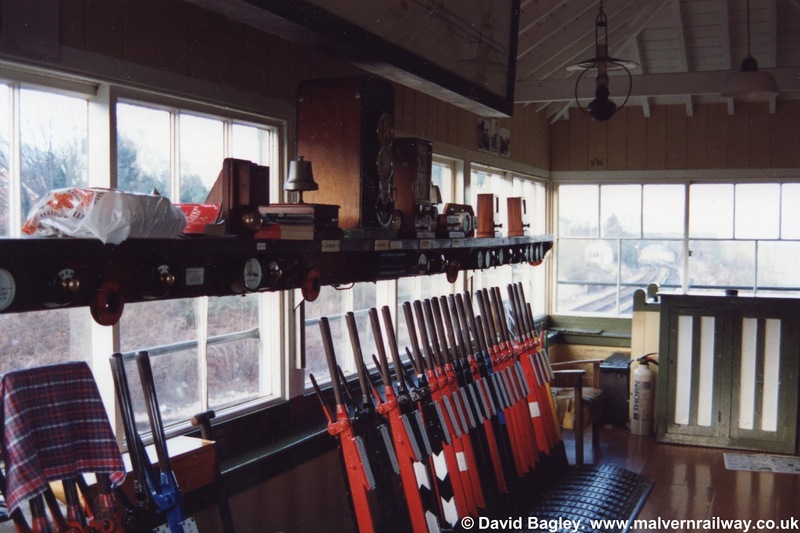 This week, I've had a big clean up of the Malvern Wells GWR page, and have added a lot of new photos which have been kindly donated to me by a couple of collectors. Why not head over there to take a look? Built in 1864, the Midland station in Tewkesbury was actually the second station constructed in the town, replacing the 1840 stop built by the Birmingham and Gloucester Railway. 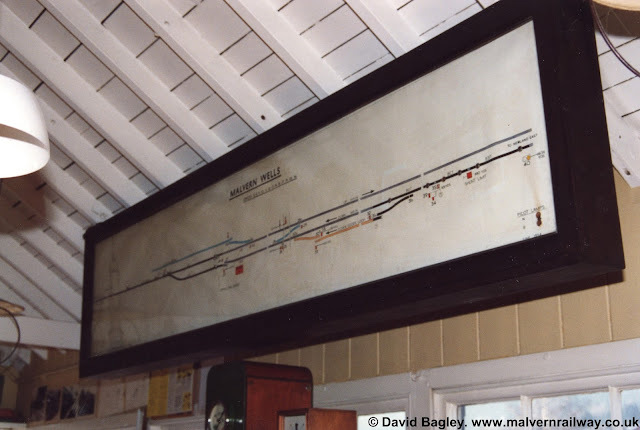 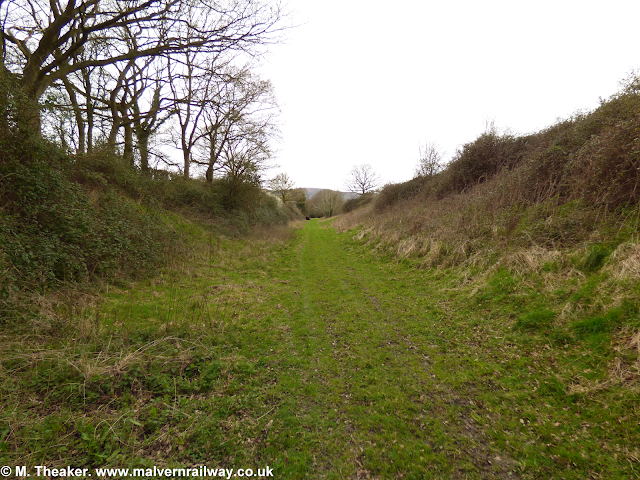 It lay at the northern side of Station Lane, to the west of a junction with the Tewkesbury Quay branch line, a small spur which connected the Malvern-Aschurch railway with the landing stage and docks at the junction of the Avon and Severn Rivers. 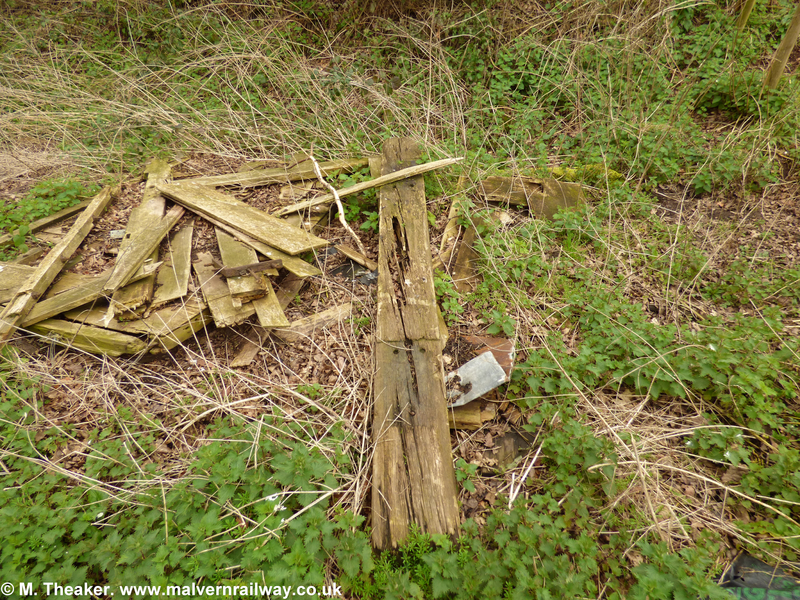 Today, little is left of the old railway, although some of its bridges do remain standing. Additionally, the path of the old line is very noticeable in the way that it still separates the houses north of Tewkesbury marina from the rest of the town. These pictures from Britain From Above show the old gas works which sat alongside the railway embankment as it crossed Bredon Road. 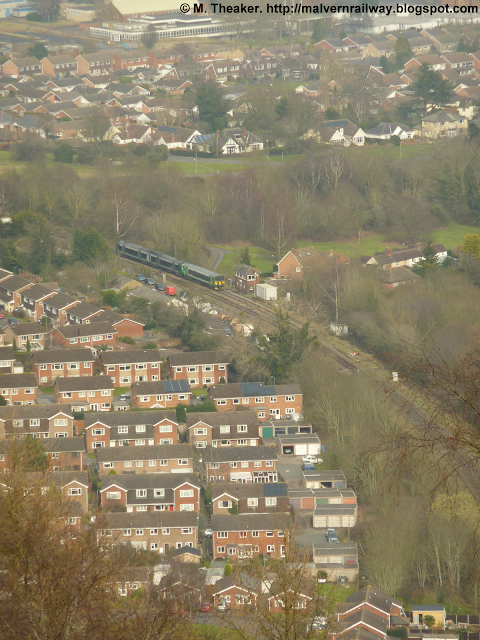 The top of High Street is also visible, as is the countryside north of the town. 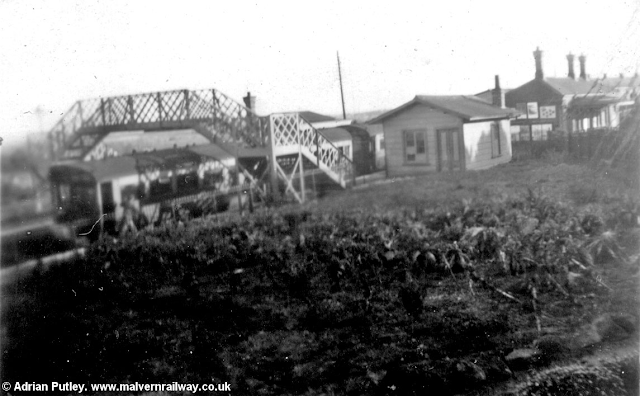 Back on the ground, these photos show the railway line in Tewkesbury in great detail, including the station itself from both the forecourt and platforms. 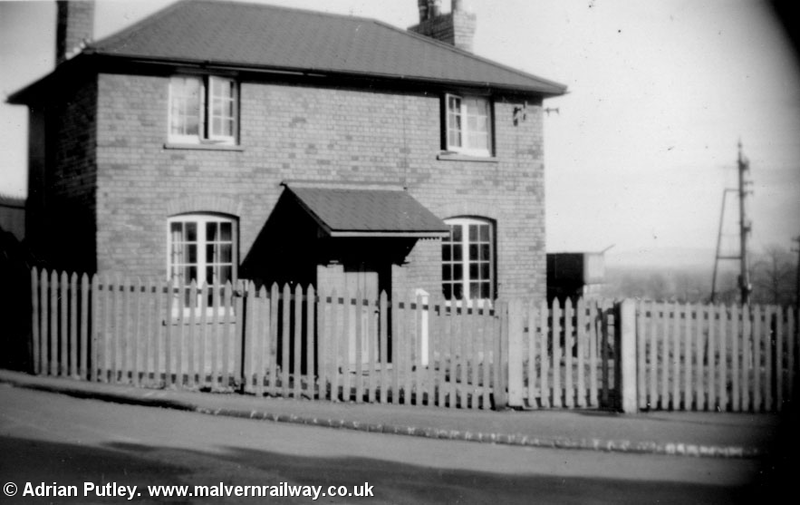 Tewkesbury Station, 10th July, 1959. 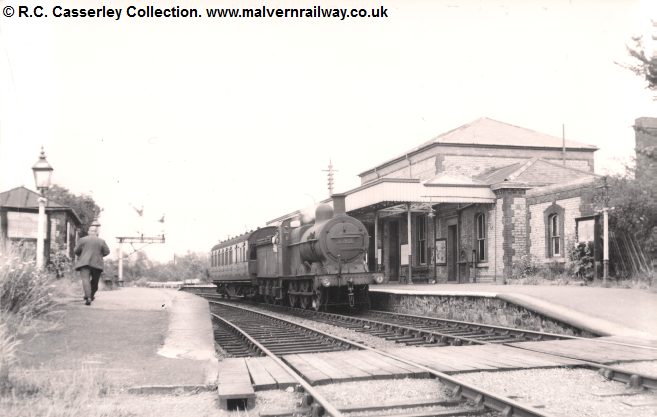 'Tewkesbury, 58071 with 8.35 from Ashchurch' 1st May, 1956. 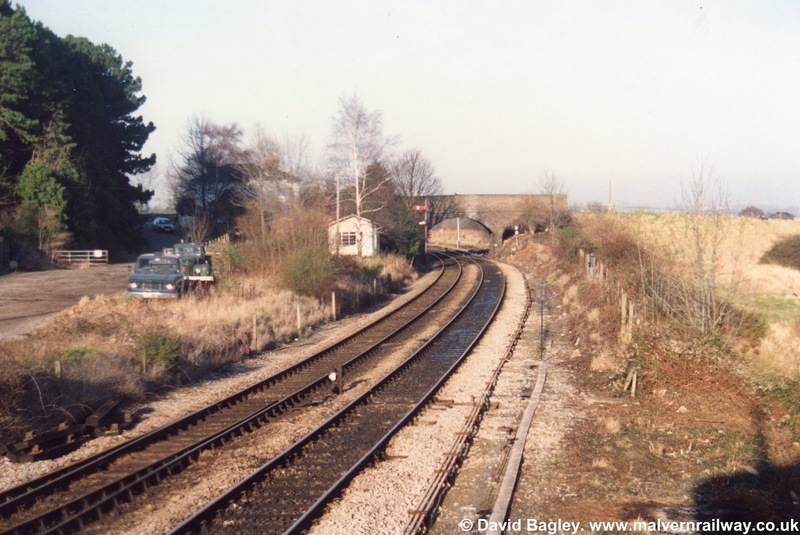 'Tewkesbury, 43337 with 6.20 from Ashchurch. 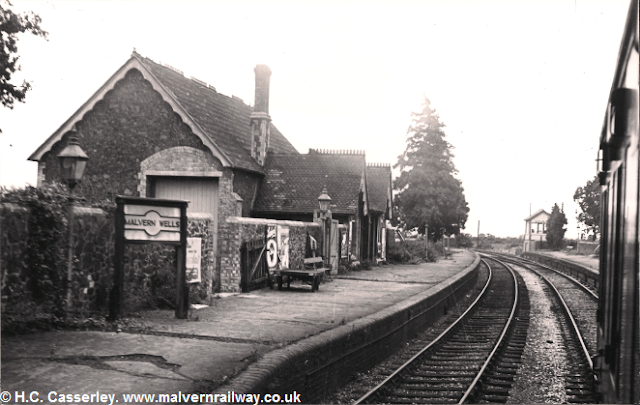 Coach 20444' 1oth July, 1959. 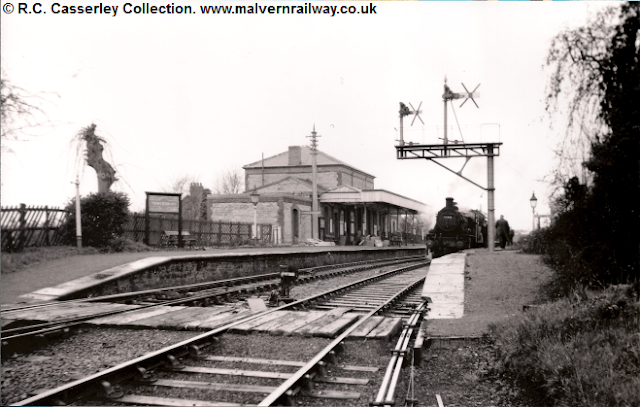 'Tewkesbury, 46401 with 8.53 to Ashchurch', 24th April, 1958. 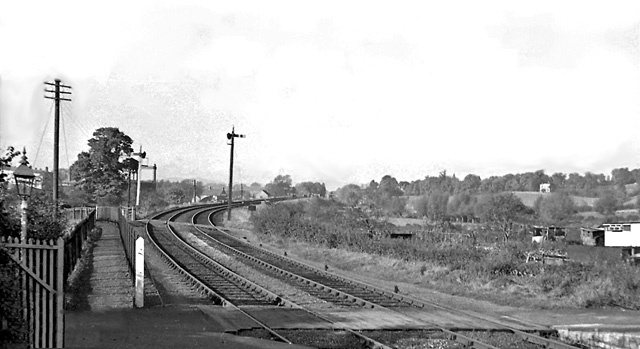 'NW view from Tewkesbury Station, towards bridge over River Avon'. 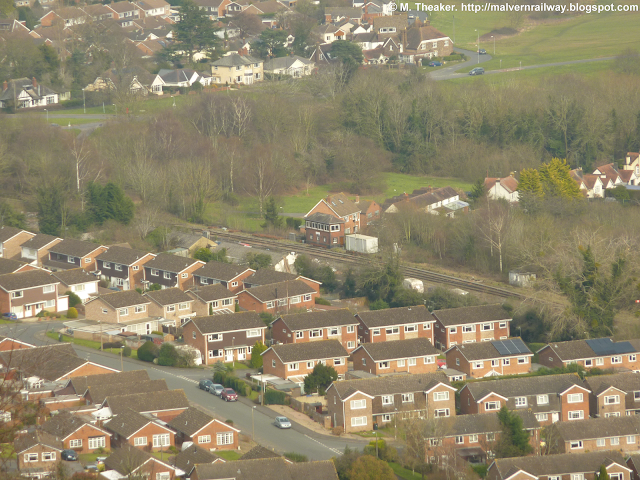 Used courtesy of Ben Brooksbank via Creative Commons. 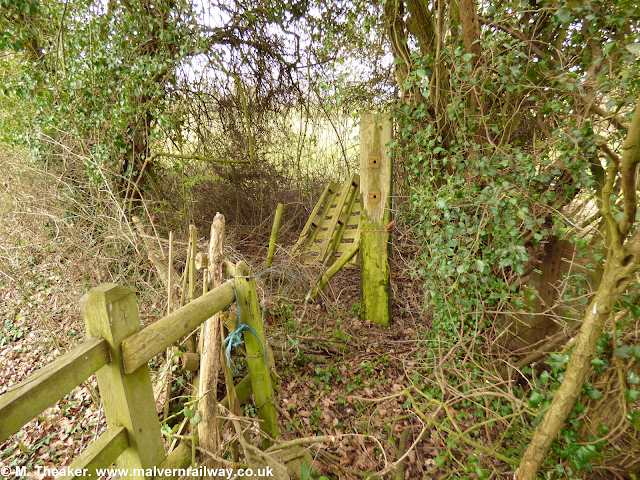 The fourth part of the walk begins underneath the surviving railway bridge at Brotheridge Green Nature Reserve and continues across the embankment on Hill Court Farm. 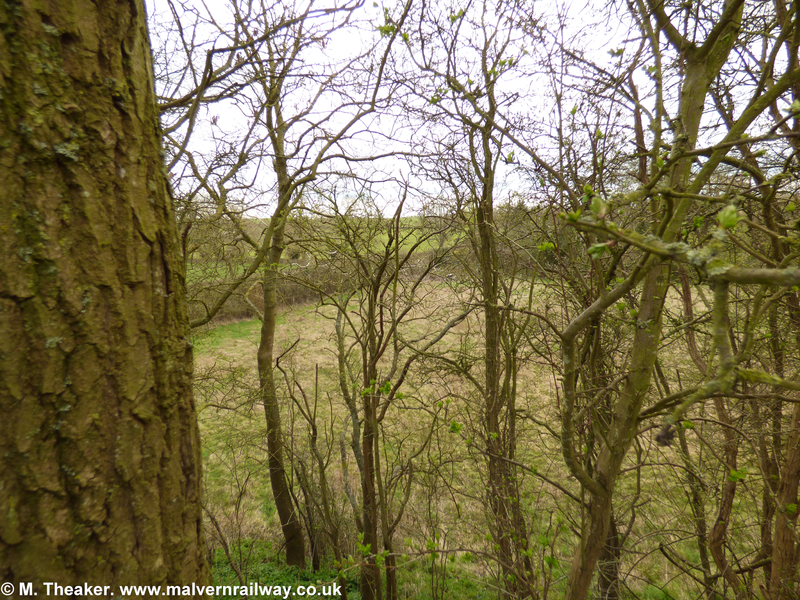 The Green is maintained by Worcestershire Wildlife Trust, who do great work at all the nature reserves they own across the county, so give Brotheridge Green a visit yourself and consider joining and/or donating to the Trust at the same time. 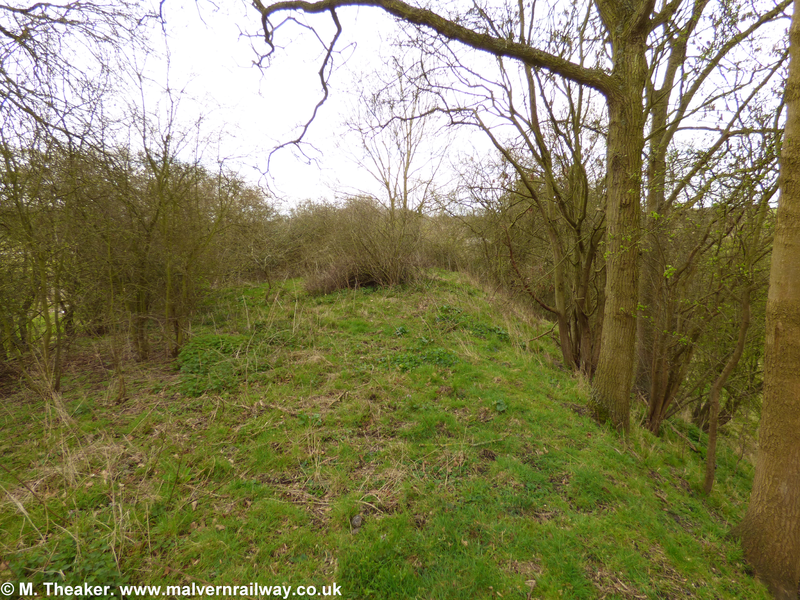 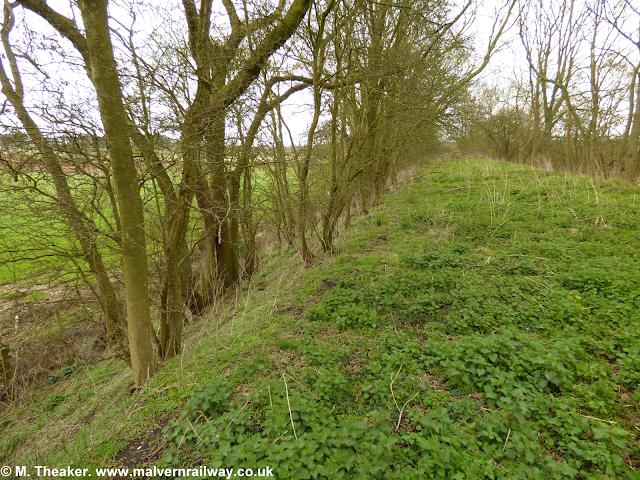 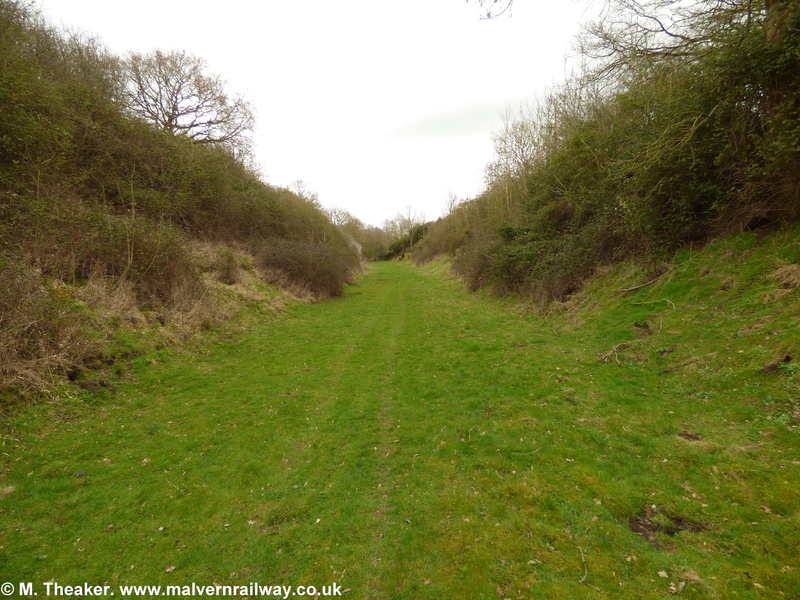 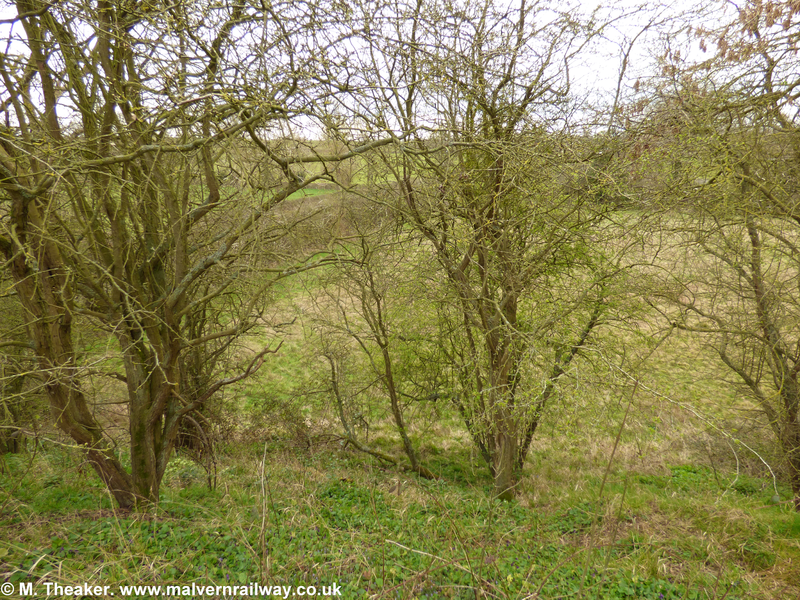 In fact, the old Malvern-Ashchurch branch line also runs next to the Trust's nearby sites at Melrose Farm Meadows and Boynes Coppice, so head over there this summer to take some pictures of the wonderful countryside. 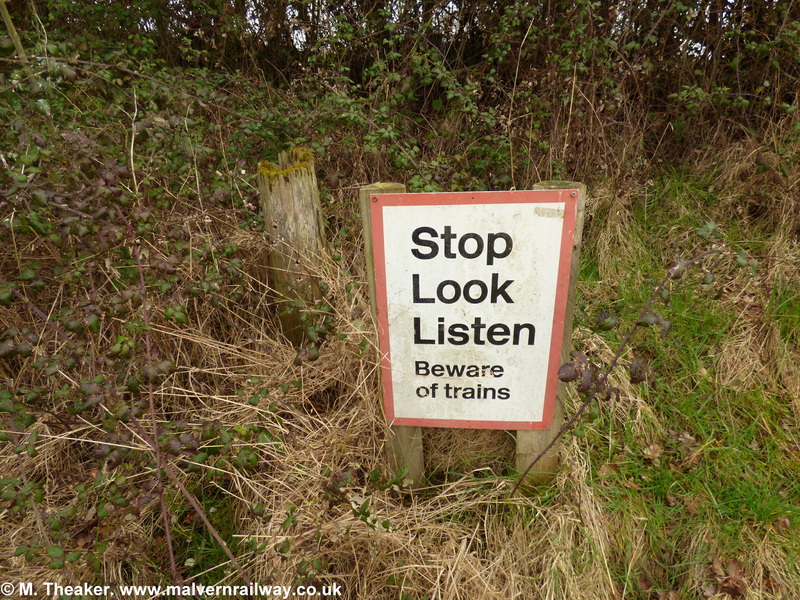 And then send them to me. 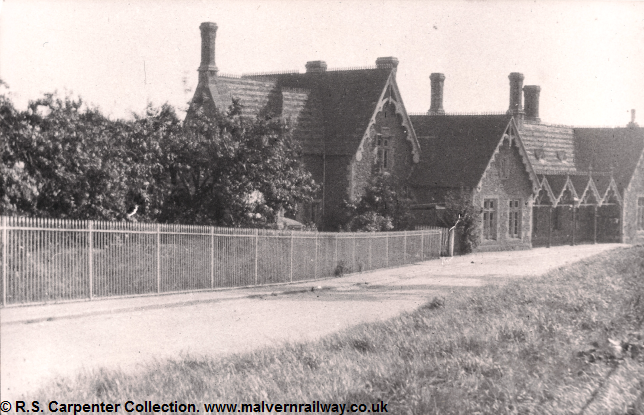 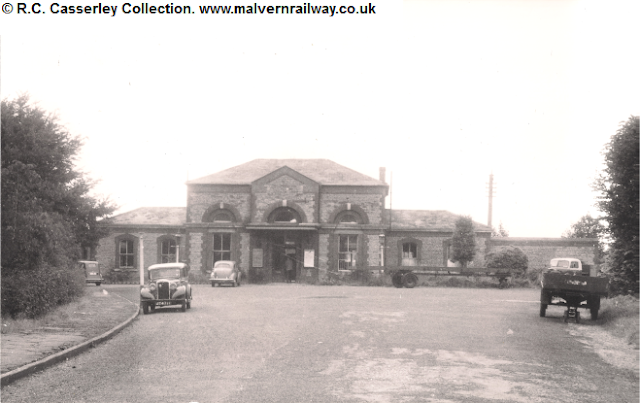 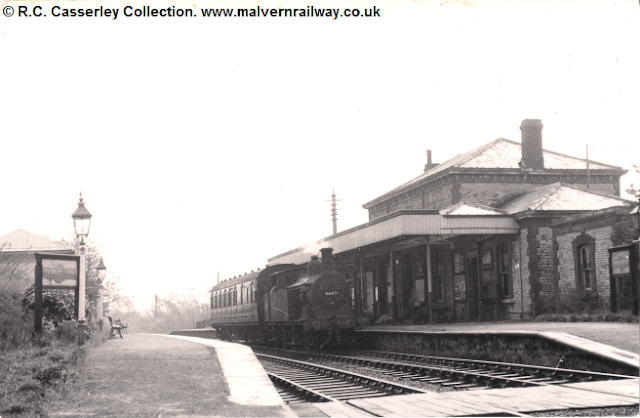 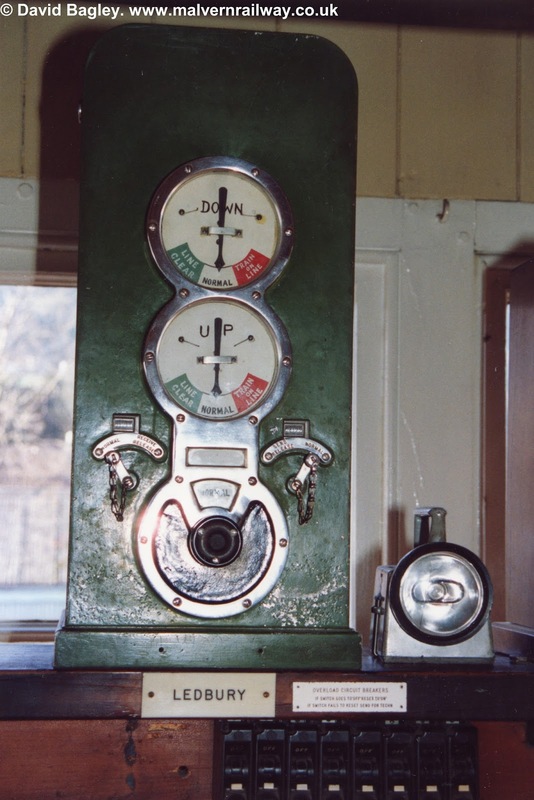 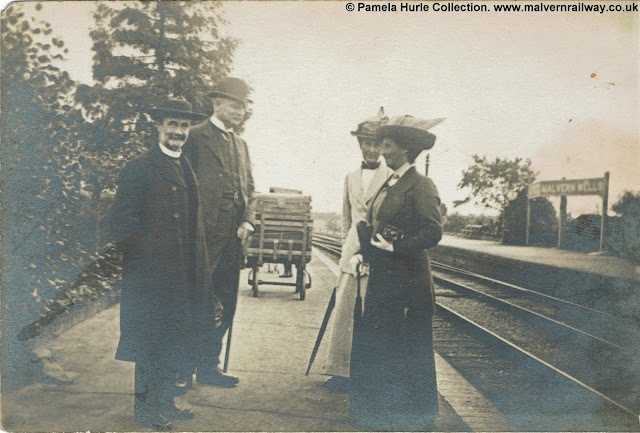 For this week's update I've found seven new pictures of Malvern Hanley Road Station for you to enjoy. 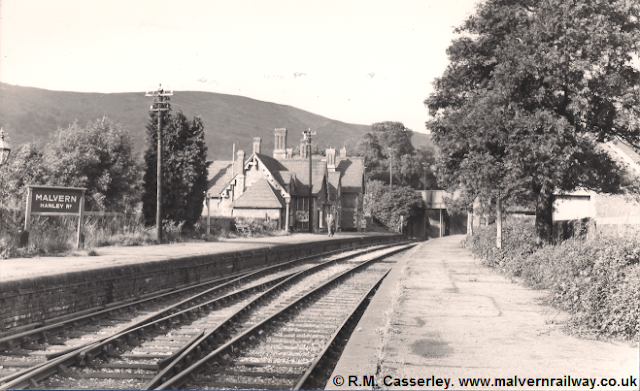 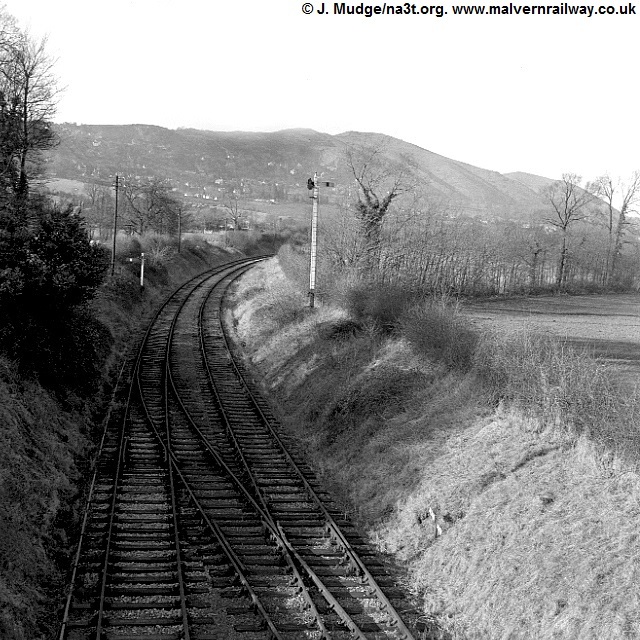 Pictures of the Malvern end of the line are rare, and I've been working very hard since this project started to find what I can from Hanley Road up to Great Malvern. 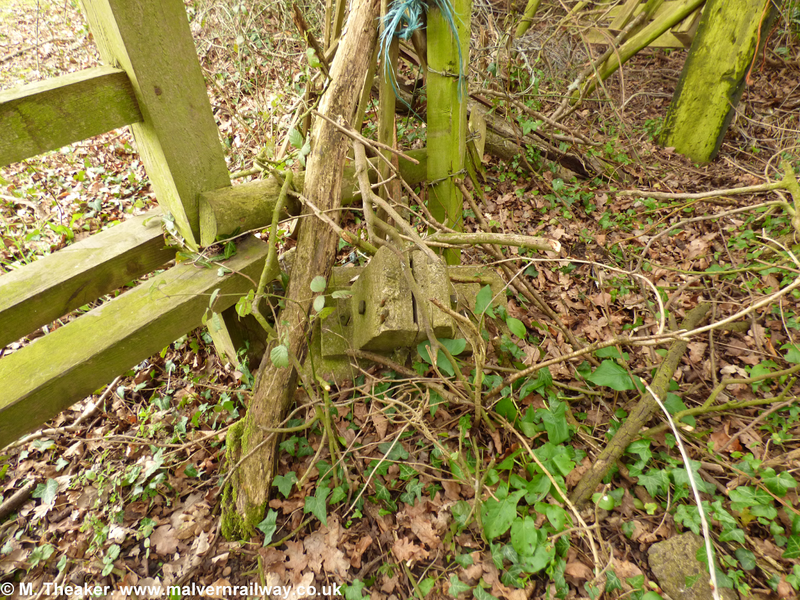 There are more on the way, so stay tuned in coming weeks to see what else I managed to find. The third part of the walk begins at the embankment overlooking the demolished railway bridge on Welland Road. Crossing the road, it covers the deep cutting across Lumber Tree Farm before emerging onto Blackmore Park Road. 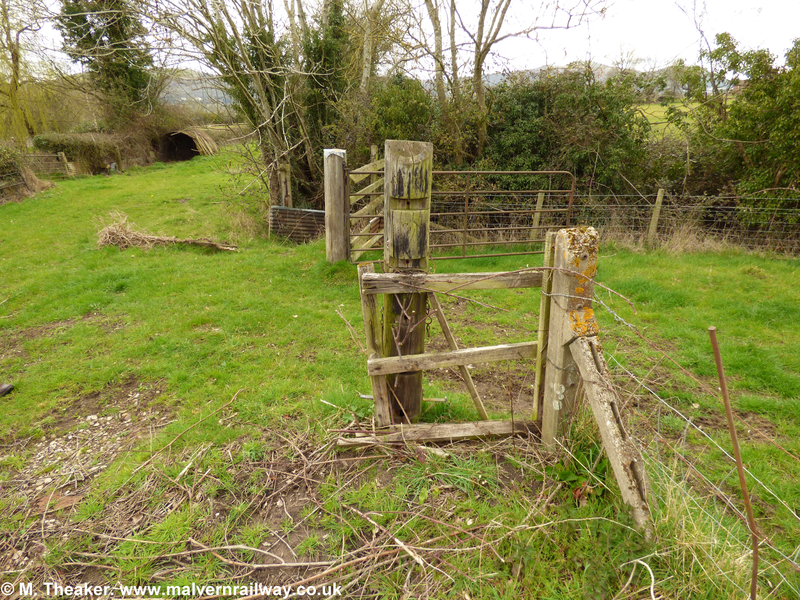 Passing through some gardens, the walk concludes at the public footpath between Blackmore Park Road and Shuttlefast Lane. The second part of the walk begins at the public footpath between Blackmore Park Road and Shuttlefast Lane. Crossing the South Site of the Three Counties Showground, it follows the tree line of the old Malvern-Aschurch branch line before emerging into a cleared field where the Hanley Road sidings complex once stood. 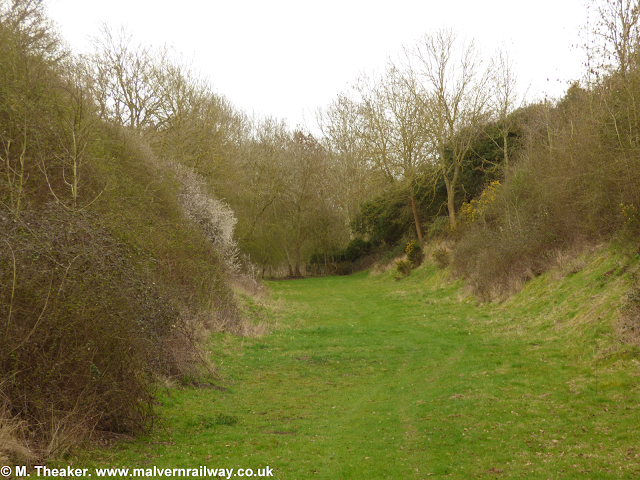 The next section of the old Malvern-Ashchurch line is a half-mile long stretch lying between Blackmore Park Road and Welland Road. 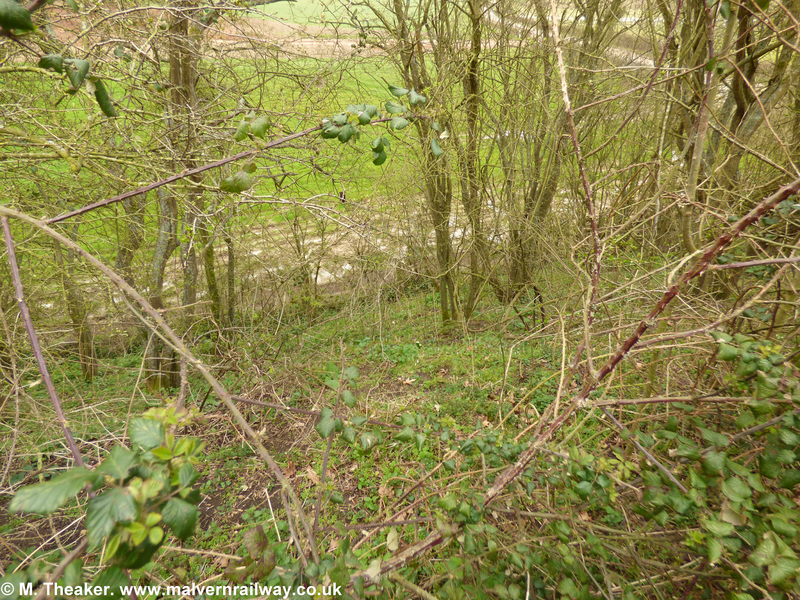 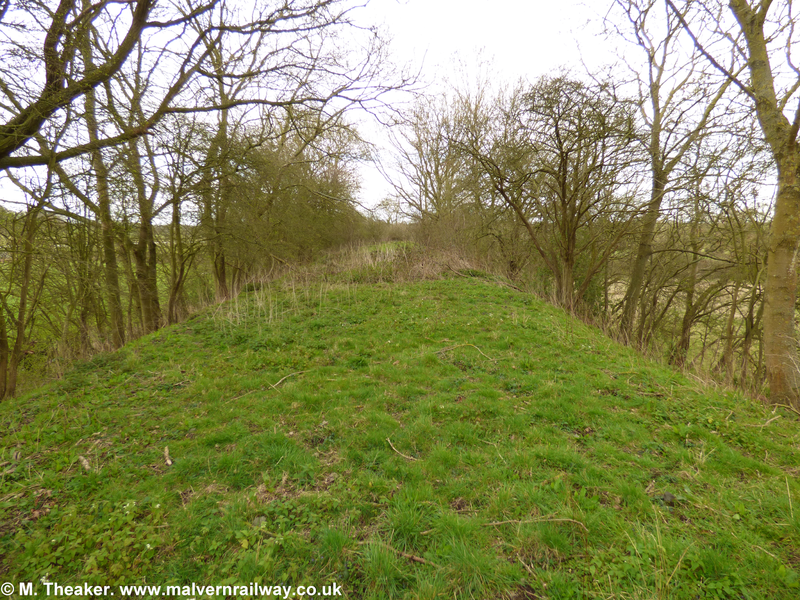 Running along flat land at the northern end of this section, the route continued in a cutting for most of the way before rising onto an embankment at the southern end to meet the now-dismantled bridge at Gilver's Lane. 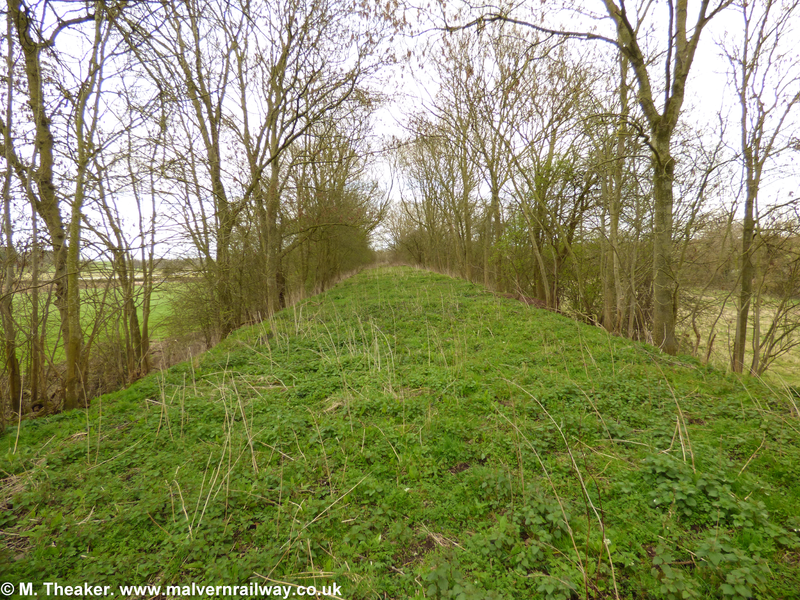 The cutting itself was quite serious, running to about 25 or 30 feet deep while the embankment achieved a similar measure in height. 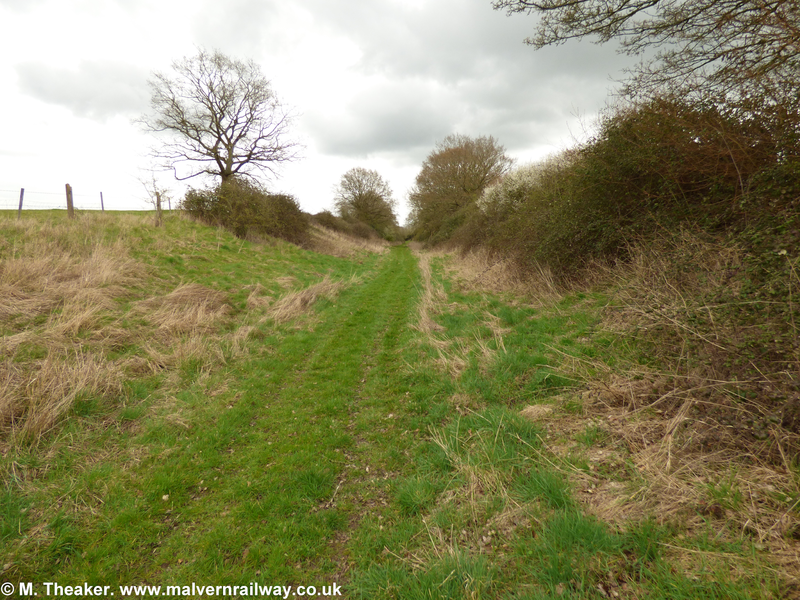 As at Warren Farm, the landscape shifts dramatically in a comparatively short stretch of line, and the unwavering smooth gradient of the line is testament to the engineers (and poor labourers!) 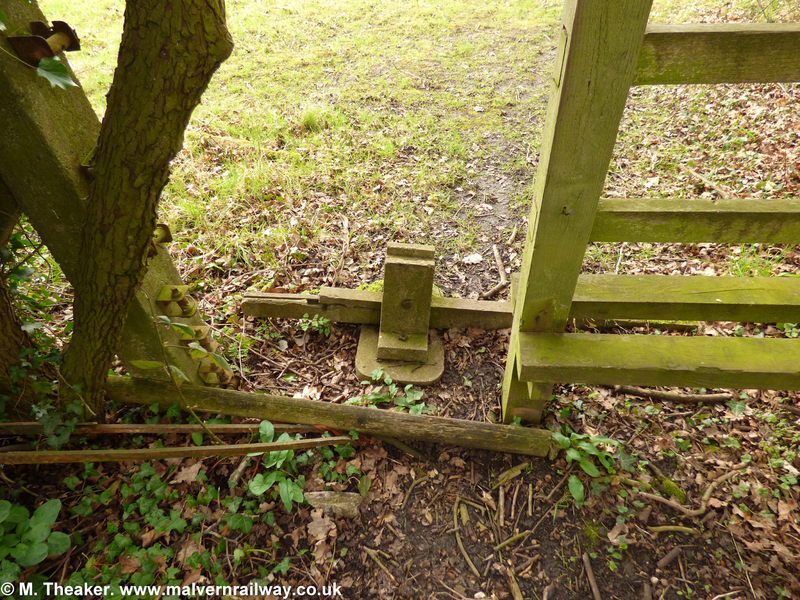 who built it. As this modern map shows, this part of the route is still exclusively rural. 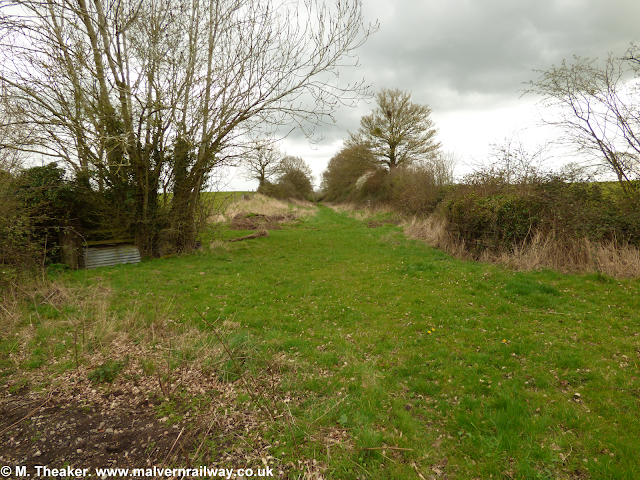 However, although the northern end of this section is crossed by a public footpath, the rest remains private land and the railway route marks the south-western boundary of Lumber Tree Farm, a large farm on the northern side of Welland Road. 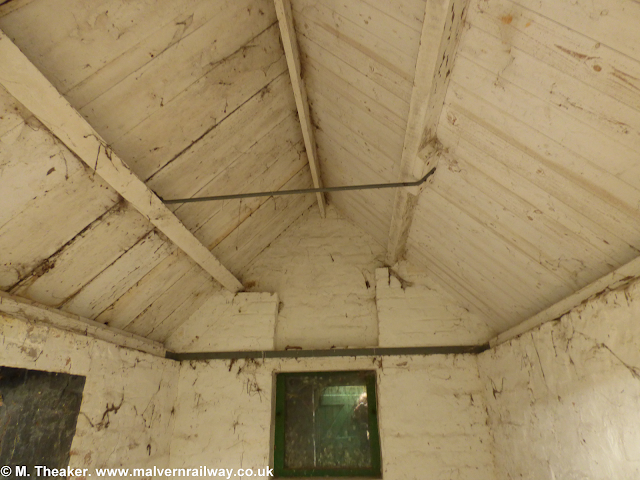 This is one of the most unspoiled parts of the line, and it remains home to several interesting original features. 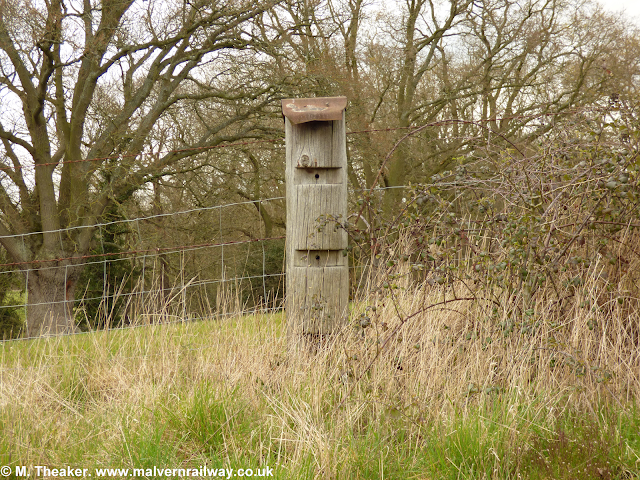 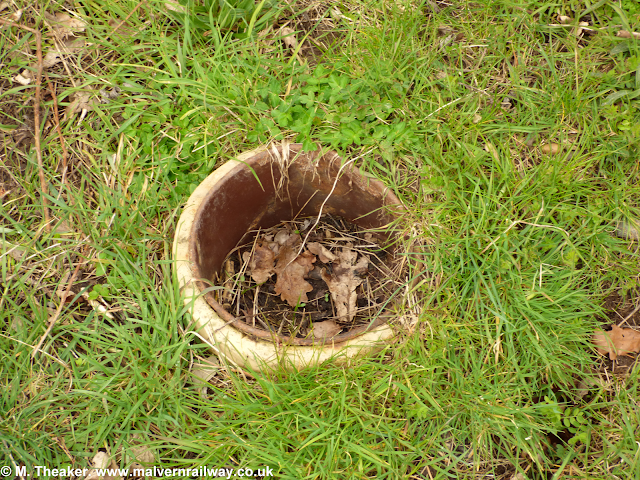 Thank you to Diana Partridge for allowing me on to her property to take these photos and to film Part III of my railway walk. 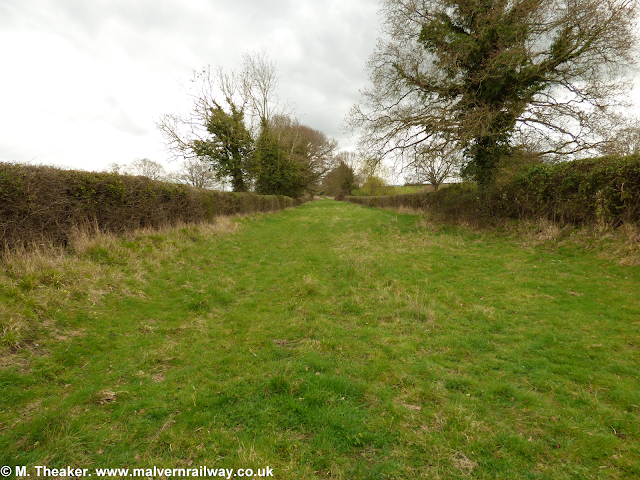 We start at the public footpath which stretches east from Blackmore Park Road and bisects the old railway line. Although the path is a bit overgrown as it crosses the railway, there are lots of pieces of railway clutter lying around in the hedges, including some unmistakeable fixing clamps. 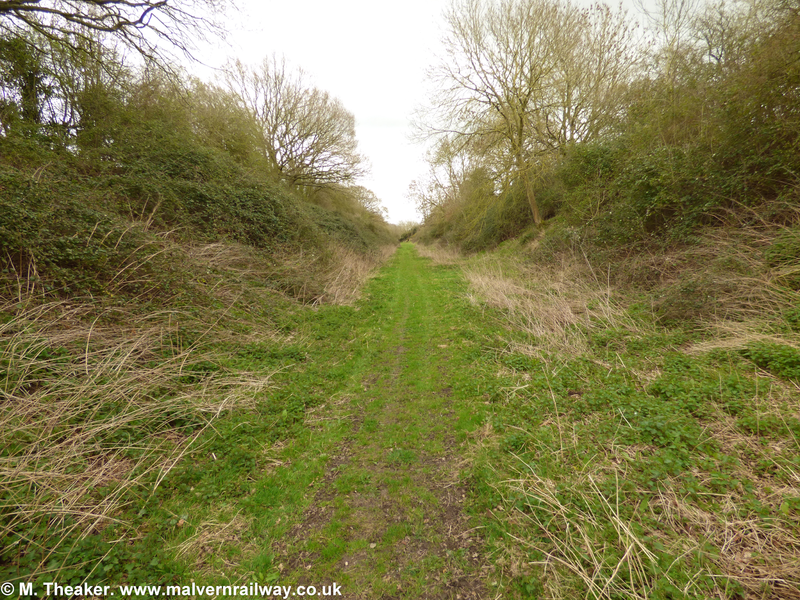 Climbing through the hedge on the right, we emerge onto the old railway line, facing south. Here, the land is flat and the old route is distinctly marked by two mature hedgerows containing several trees. This fencepost is actually the top of an old railway telegraph pole, with its tell-tale 'tin hat' or sloped top. 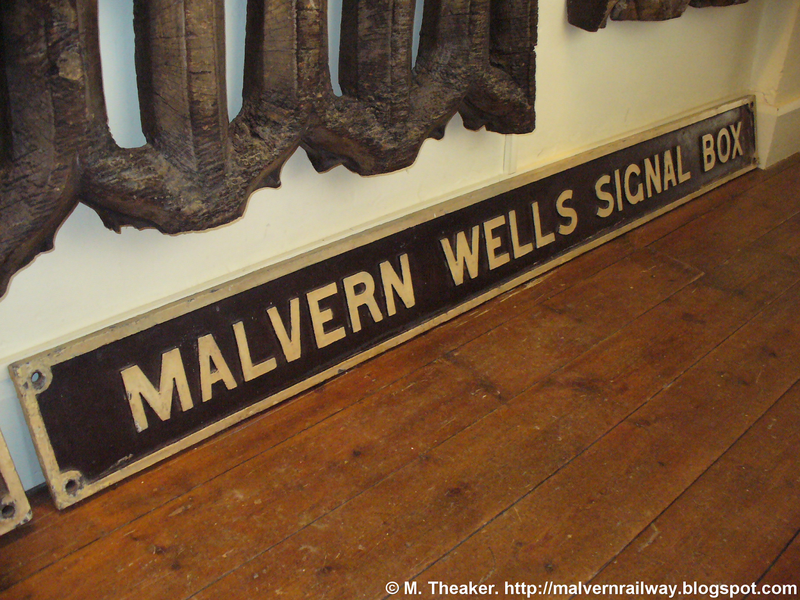 An old railway sign (not original!) 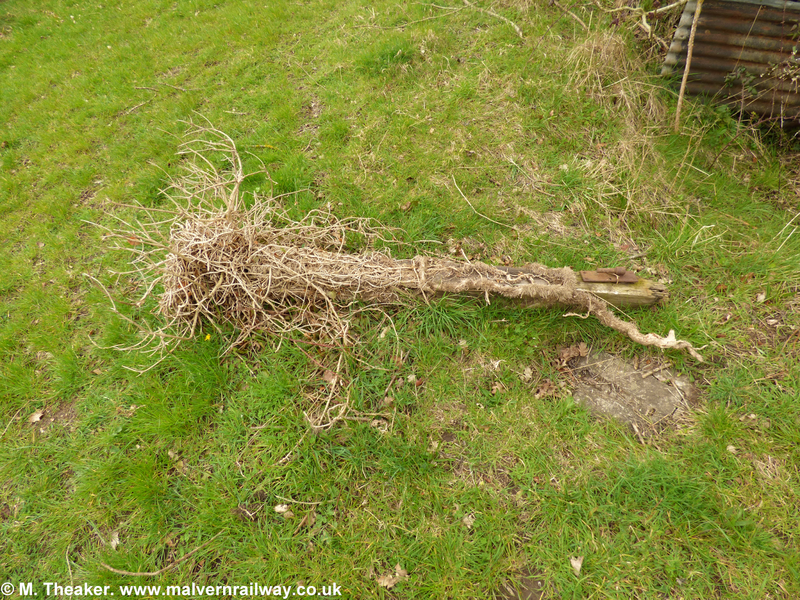 and dismembered telegraph pole. 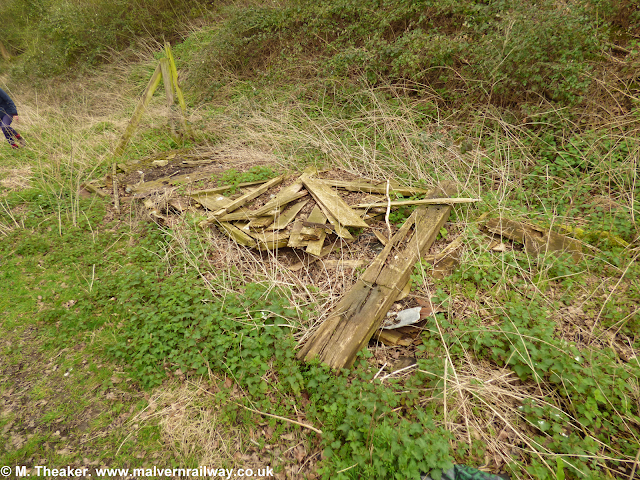 About halfway down the line at Lumber Tree lie the remains of what seems to have been a wooden shed. 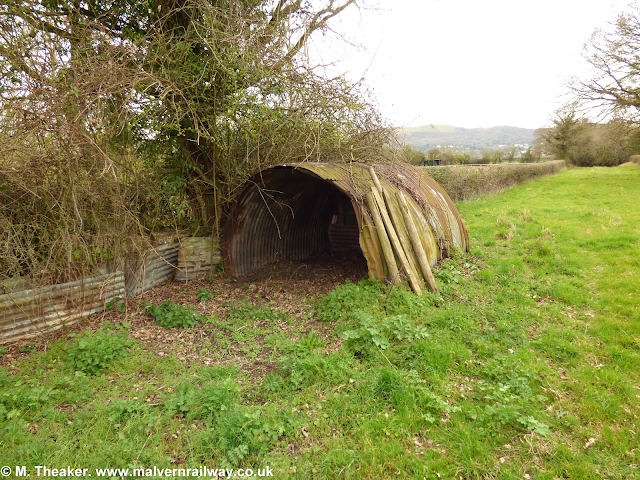 This may not be railway related, but the curved roof section and stovepipe hole suggests a repurposed goods van or similar. 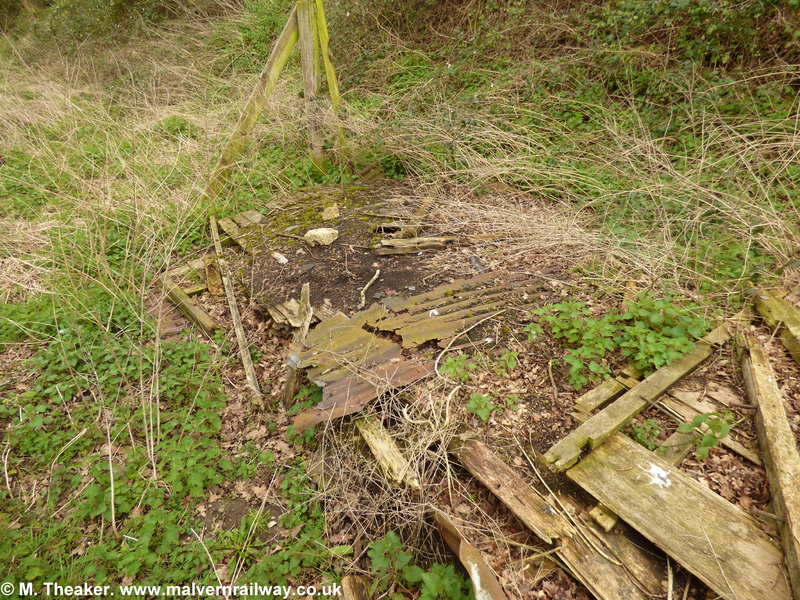 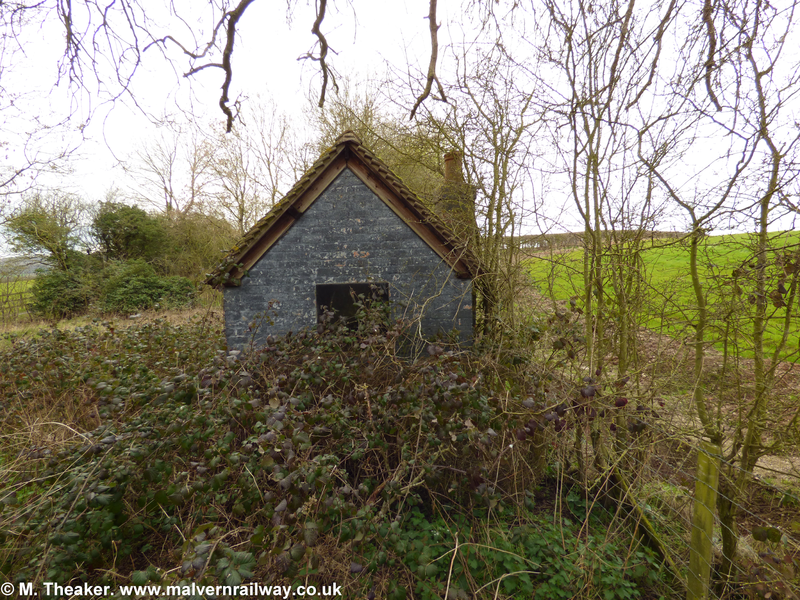 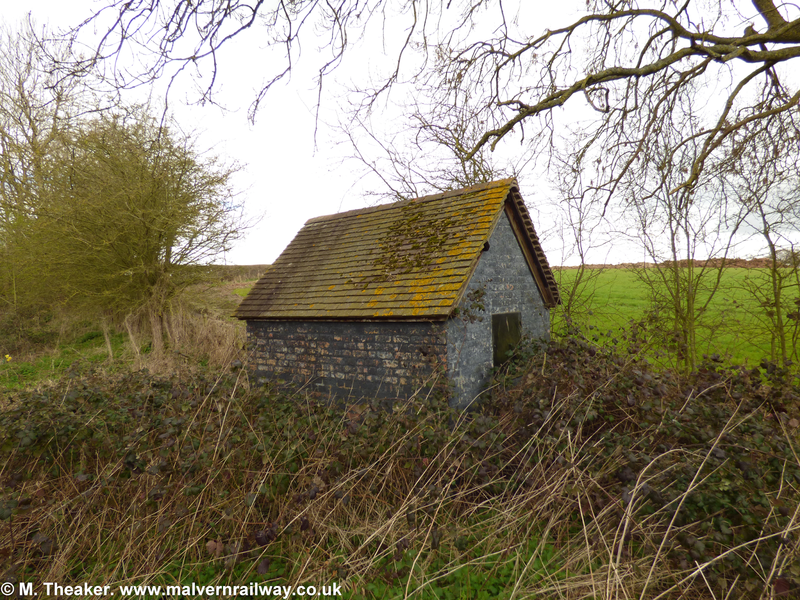 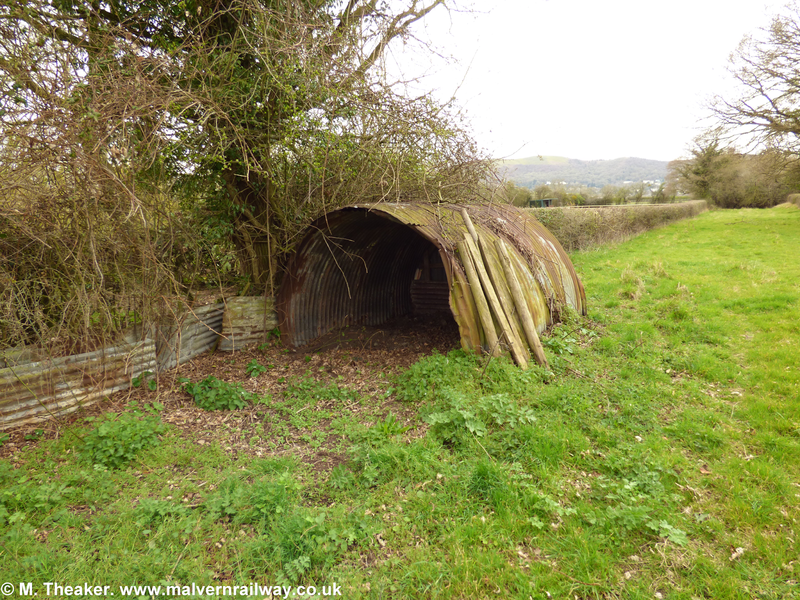 My guess is this is an abandoned temporary railway shed which may have been used by previous farmers. 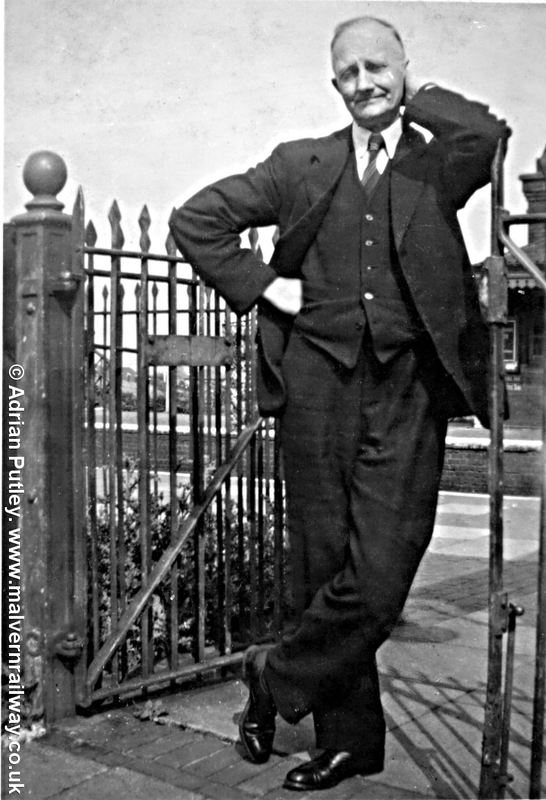 Answers on a postcard! 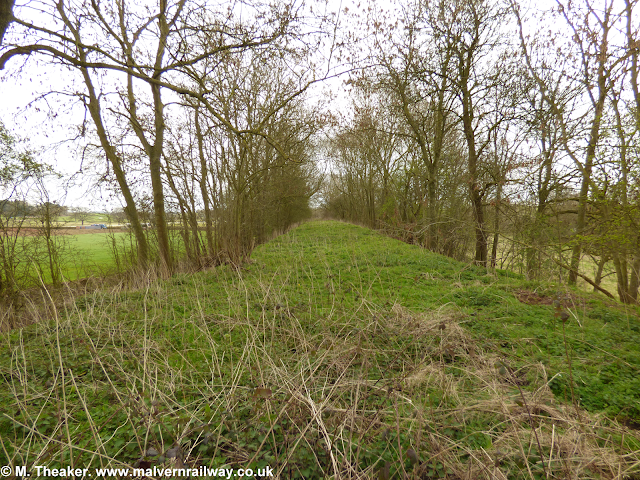 Heading further down the line, the full extent of this impressive piece of engineering becomes clear. 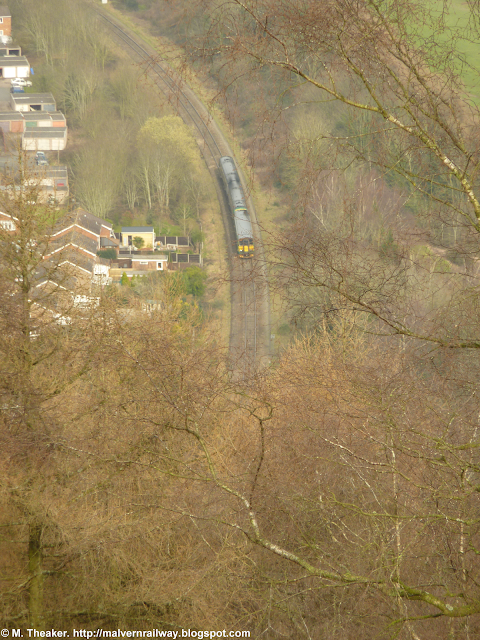 Overhanging the deep cutting is a railway cottage, which sits about thirty feet above the railway line. 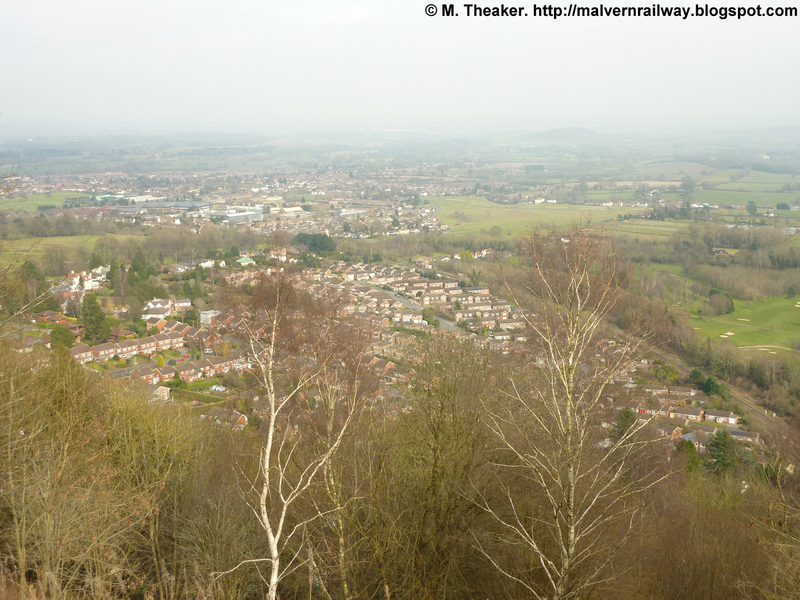 Turning around briefly to look back towards Malvern. 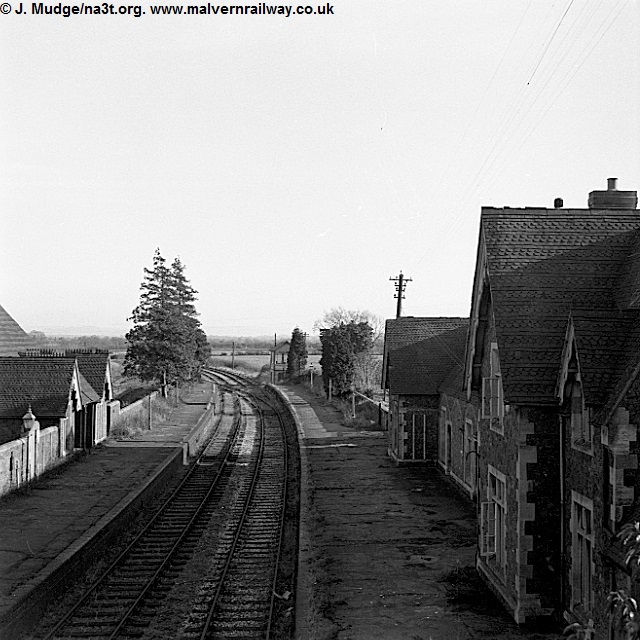 The cottage overlooking the line. 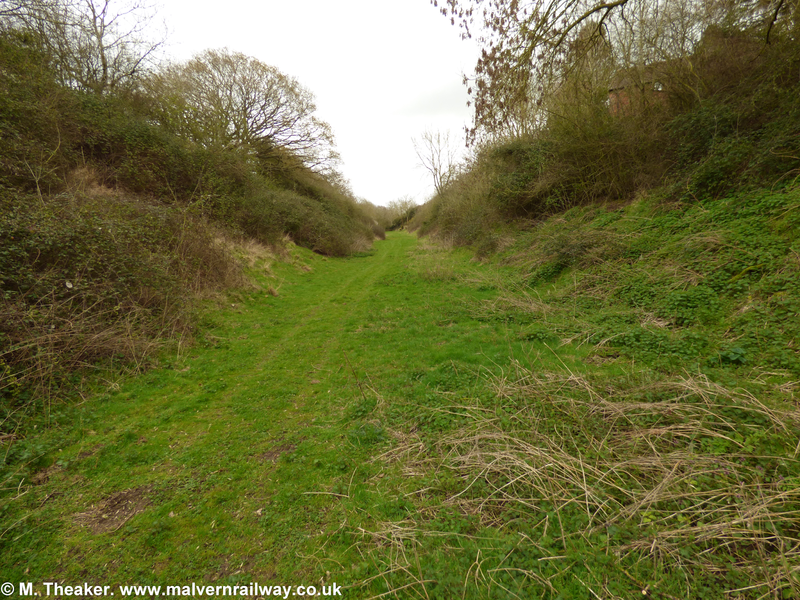 Looking towards the end of the cutting. 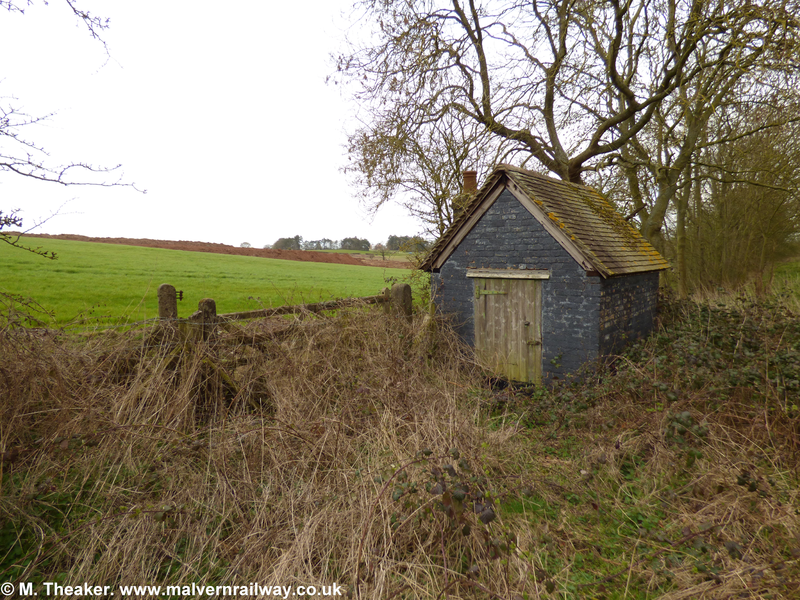 By far the most interesting railway relic on this stretch, however, is a completely intact permanent way hut just north of Welland Road. 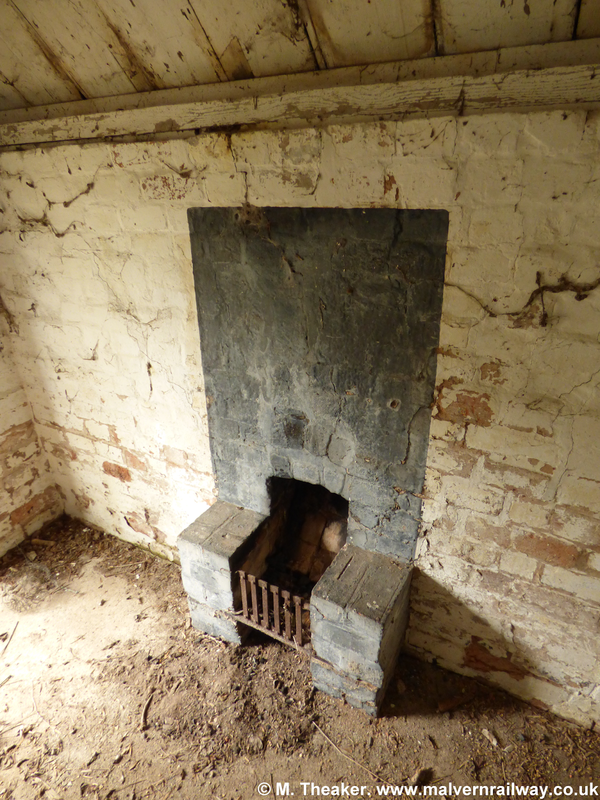 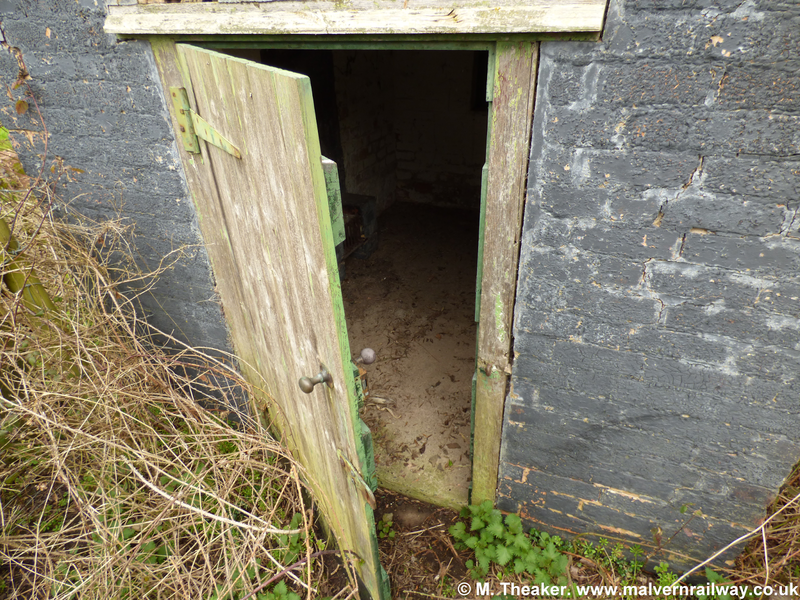 The hut is in good condition, with a small hearth inside and glass still in the windows (although these have been boarded over). 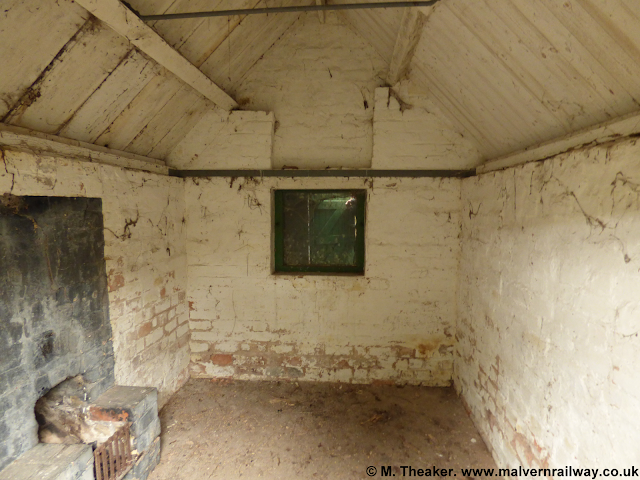 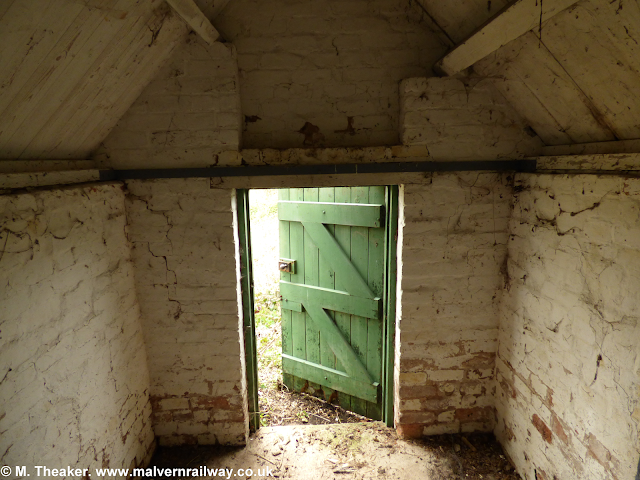 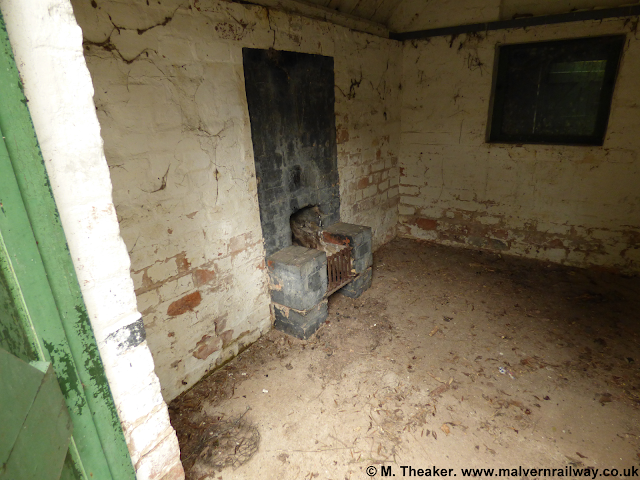 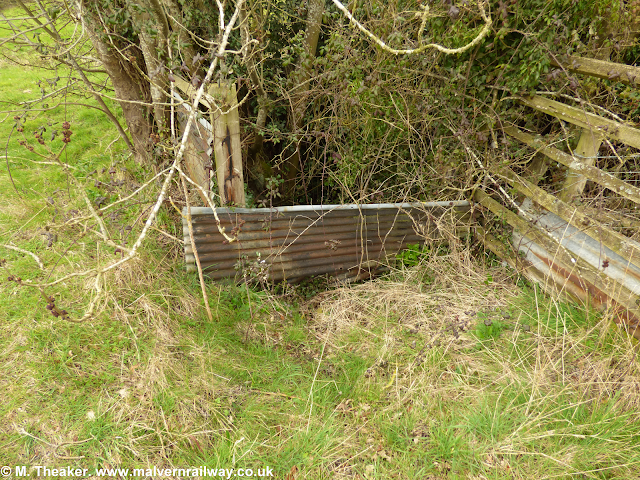 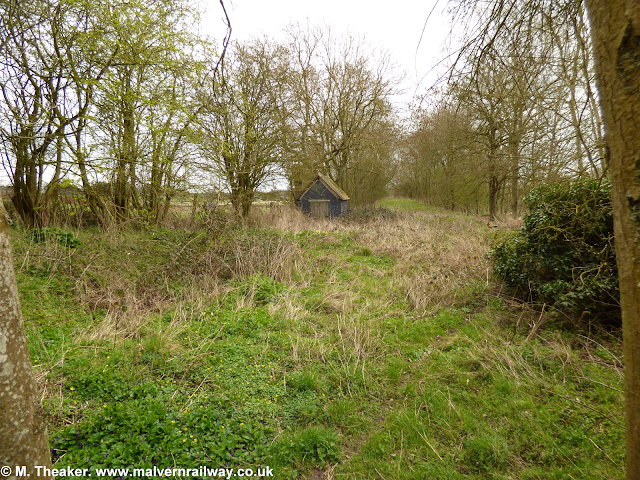 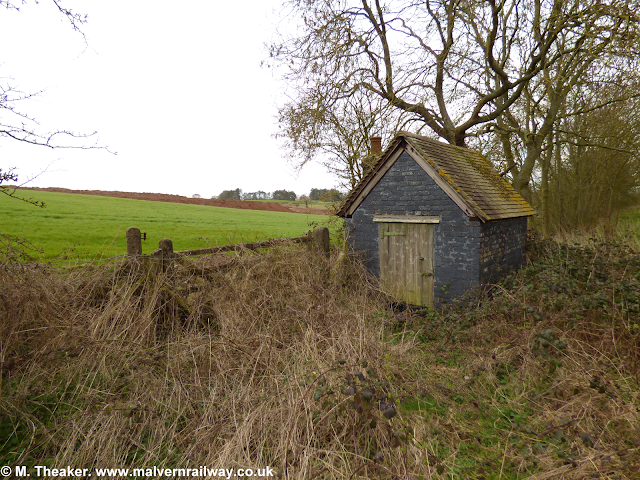 Bob Hobbs suggests that the permanent way hut may also have served as a signalman's hut in foggy conditions, and the building also stands next to a stock gate which farmers used to cross the line. This is the only flat crossing point on the line for about half a mile, so this would be the only place such a gate could have stood. 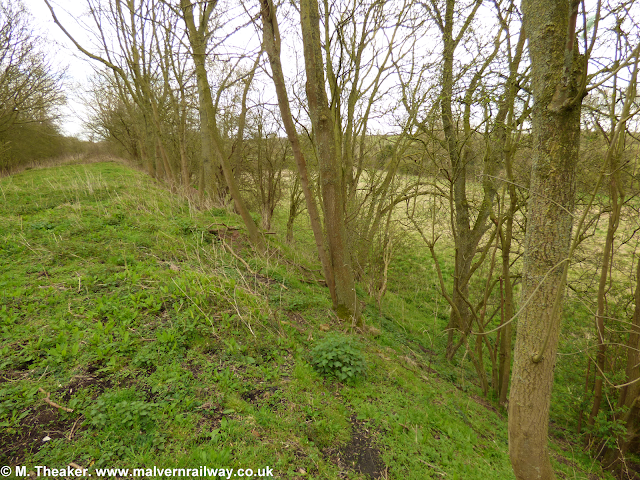 Continuing south on the embankment, the line soon rises to quite a height overlooking Welland Road. The gradient here is a gentle climb up to what was once the brick bridge across the road at the junction with Gilver's Lane.